Kids have a great time on a family vacation in the Glacier area, with many natural wonders, outdoor activities and beautiful scenery that will remain in memory for a lifetime. 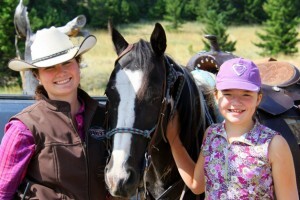 True Montana adventure & hospitality awaits everyone in your family. 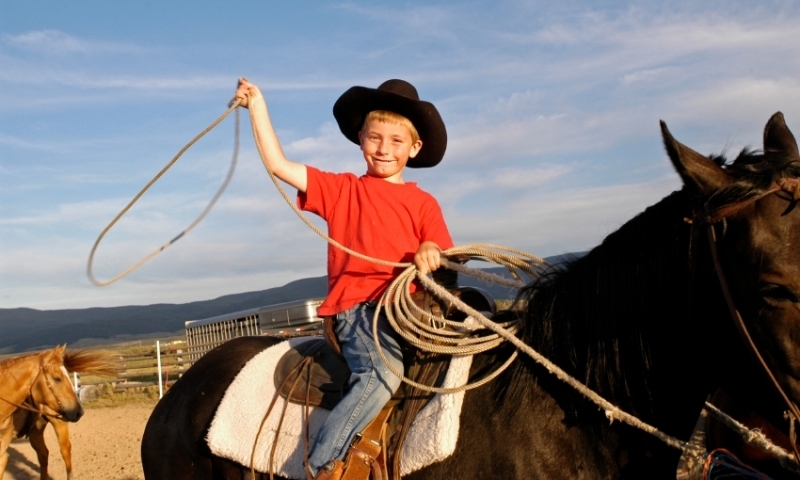 All ages will love our daily activities including shooting, roping, riding, fishing, swimming & more. Seeing both Glacier and Waterton National parks in the same trip is an amazing experience. Kids especially love the hikes, waterfalls, animals and throwing rocks at lakeshore. Come enjoy a short or longer-duration llama trek into the Montana backcountry near Swan Lake. See our options, rates and photos of llamas and what is involved. 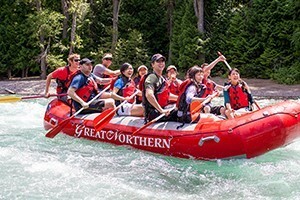 Providing exciting scenic & whitewater raft trips on the lower Flathead River, and leisurely Flathead Lake sea kayaking and paddleboard rentals. From our vintage 1960's era amphibious water-craft, take a tour of the clear waters of Flathead Lake from our Polson launch location. Kids & adults. Visit our Native American Art Gallery, with overnight Tipi accommodations, meals, horseback riding, tours and beautiful scenery. A peaceful, elegant vacation stay almost as beautiful as the name itself. Lonesome Dove offers horseback riding, cowboy breakfasts and B&B rooms. A place where children and adults may come to express their inherent creative nature and to learn about the world of art. Providing top-quality Polaris rental sleds, select from do-it-yourself trail touring, or hire one of our guides for a safe backcountry adventure. 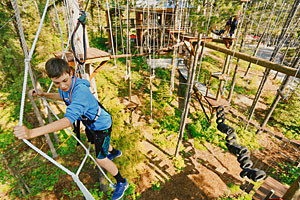 Fill your family’s schedule with tons of summer activities on your vacation to Glacier. Flathead Valley and Glacier National Park in northwestern Montana offer many adventures for everyone. Biking adventures abound in the Glacier area. Within the park is a two-mile paved trail from Apgar to West Glacier. Kids love to bike through the woods, getting great views of the mountains and wildlife. Be sure to bring your camera so you can get a shot of your child’s first catch. From Hungry Horse Reservoir to Kootenai River, you can give your kids some challenging fishing adventures throughout the Glacier region. With a number of interpretive trails within Glacier National Park, you will find plenty of information about the area by following these short treks. To find one right for you, check out Sun Point, Swiftcurrent Lake or Huckleberry Mountain. One of the favorites is Trail of the Cedars in the Avalanche Picnic Area. A little over half a mile long, it’s great for even the smallest child. Flathead Valley is a marvelous area to get in some horseback riding, with the views making a fitting backdrop to your adventures. Gentle horses are provided, making it an uneventful trip for a small one. Kids love whitewater rafting and the excitement generated by braving the rapids of a wild river. Try Flathead River or the Kootenai River at Jennings Canyon. Guides will ensure your children stay safe on a ride that they can easily handle. All lakes in Glacier National Park permit canoes and kayaks, and there are a number of rivers in the valleys and forests surrounding where you can travel at your own speed through marvelous landscapes. Guide services will be happy to take you on adventures around Glacier, while providing all supplies needed. 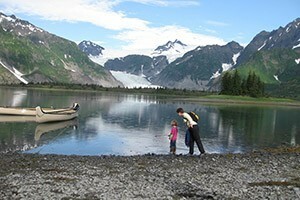 Boat tours are great for the kids, too, where they can enjoy the lake and sun while viewing the wildlife on the shores. Breathtaking views await the family as you drive through the park. Take Going-to-the-Sun Road for the most comprehensive visit in an incredible 50-mile drive. You can stop for hiking, horseback riding or boat tours. Kids will learn a lot about Glacier Park, including its geology and glaciers, at an exhibit made just for children at the Apgar Visitor Center. 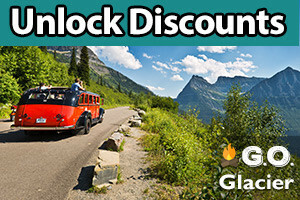 Many visitors to Glacier travel to Waterton to enjoy the scenic drives. Kids love to peer out the window of the car to catch a glimpse of wildlife on the forest edge or climbing mountain cliffs. 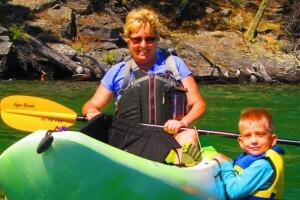 You can take the little ones on a boat tour on Upper Waterton Lake as well. Flathead Lake offers many activities that will fill your days, such as hiking, boating and fishing. You can rent a sailboat and move silently over the water, only the sound of the gentle breezes in your ears. Hiking, fishing and rafting are all fun activities for kids within this wilderness area south of Glacier. They can also watch the wildlife in their natural environment. The Middle Fork River provides some exciting whitewater rafting, with calm sections fit for the younger ones. And you’ll see grizzly bears, mountain goats and bighorn sheep, thrilling for the kids when these fascinating creatures are spotted! Swimming beaches on this lake offer plenty of water fun for the kids, while Dad fishes for Kookanee salmon and rainbow trout. Launch a boat from any one of the many launching areas or marinas. Have a picnic on the lakeshore. Whitefish Lake has great fishing and the kids can throw in a line and get the reward of a sizable mountain whitefish or rainbow trout. Hiking is also wonderful nearby. Within Glacier National Park, you can’t miss Marias Pass. If your kids love trains, this is the place to come to watch as they make their way across the Continental Divide. Here you will find the historic Nez Perce Trail, and your children will experience the forest as Lewis and Clark did on their famous expedition. Within the forest is the Rattlesnake National Recreation Area where the family will marvel at the wildlife, such as mountain lions and hawks soaring high overhead. The National Bison Range contains large herds of American Bison, not far from St. Ignatius, Montana. See these animals for yourself, and watch the kids’ eyes light up as they spot them grazing the grasslands. It doesn’t matter whether you are boating on the reservoir or hiking through the surrounding forests, the whole family has a great time visiting this wonderful spot. Fishing is a popular activity and you can be assured your kids will catch some fish. 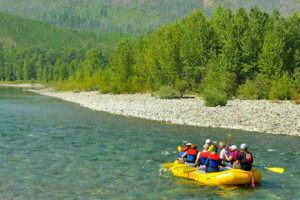 Some outdoor fun is in store for you and your family at the Kootenai River, with fishing and rafting the favorite pastimes. You can use float tubes to get out on the water, or just throw in a line from the shore. The kids won’t care; they’ll just have the time of their lives around this river. All along the river, you can access hiking trails that take you into the backcountry. You can also ride horses through the wilderness for a unique adventure for your children. 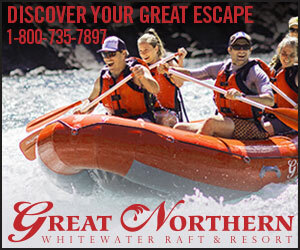 The North Fork is great for whitewater rafting, with gentle Class I and II waters. There are 15,000 acres here for your hiking and camping pleasure. Try the Jewel Basin Hiking Area for ideal trails for all levels of hikers. Spot lots of moose, elk and Rocky Mountain goats as well as beavers and porcupines. The Lewis and Clark National Forest is the perfect place to do some scenic driving. Taking the Kings Hill National Scenic Byway is the best to get from Glacier to Yellowstone National Park, if you are planning to stop there too. Wildlife and bird watching are at their best here in the Mission Mountains. Kids love to see wildlife in their native habitat, doing what they do naturally. They have the chance to see mountain goats and mountain lions, and also grizzly and black bears. There are 50 species of birds living in these forests. Wildlife is abundant along the Milk River, and it is perfect for a quiet float trip. The entire river is a Class I, making it wonderful for family rafting. In Kalispell Montana, this museum shows some wonderful examples of pioneer living. The kids will get a real education about the early days of America. There are beautiful views of the Swan Mountain Range, too. Just west of Browning, the western gateway to Glacier National Park, you’ll find the Plains Indian Museum, with its displays of arts from the Northern Plains tribes. Check out this Indian museum on the Flathead Indian Reservation, displaying a large collection of Native American crafts. A wildlife exhibit is always a fascinating thing for the kids to see. You can even buy some gorgeous silver jewelry or other items for gifts or souvenirs. Let the kids wander through an authentic pioneer village, seeing the school and shops from the late 19th to mid-20th century. This museum is in Polson, Montana and contains around 160,000 items from early America up to when man walked on the moon. If you are in the Glacier region in July, spend your Fourth of July in Whitefish, Montana. On the lake there will be festivities in the evening, including lots of good food, live music and fireworks. Kids can participate in educational and volunteer activities to earn service club badges and become a “Junior Ranger” by completing particular Junior Ranger activities during a ranger-led program. Known for its many gorgeous lakes, Waterton National Park offers spectacular sightseeing. As the 2nd largest wilderness area in the lower 48 US states, Bob Marshall hosts a variety of wildlife and sightseeing opportunities. Tour this forest where Lewis and Clark and the Nez Perce once trekked. See where nearly 500 buffalo roam on protected grasslands and stop at the Visitor Center for videos and other related information. Introduce your kids to taking pictures in one of the most beautiful places on earth! Keep your distance as you watch for wildlife like bears, mountain goats, bison, moose, elk and coyotes either on a scenic drive or nature trail. Flathead Lake is a great place to introduce kids to icefishing for lake trout, whitefish, northern pike and rainbows. The whole family can get some great exercise and access extraordinary terrain on snowshoes. Consider employing a guide knowledgeable in winter survival as well as area history, ecology, and geology of the northwestern corner of Montana. Snowmobiling is not permitted inside Glacier Park boundaries, so consider a snowmobile tour and guide service from those listed on this page, and you’ll be climbing hills and zipping through 200-plus miles of groomed trails in the Flathead Valley and Glacier National Park area. Enjoy a spin in a sleigh ride and hear your guide’s stories and learn about the Glacier National Park region before enjoying a great Montana, country-style dinner.